In case of accidental over-pipetting, self-sealing filter tips provide additional protection against contamination by forming a sealed barrier upon contact with the sample liquid, preventing it from passing through the filter. The ability to recover the sample as much as possible thereafter is questionable. An investigation was carried out to determine the sample recovery rate of self-sealing filter tips following over-pipetting of water. 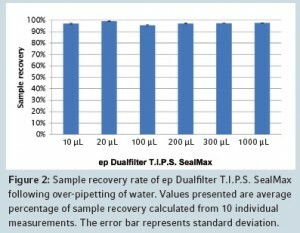 Results show that nearly complete sample recovery is achievable using ep Dualfilter T.I.P.S. SealMax with regard to water. It has the highest recovery rate and reproducibility irrespective of the filter tip size when compared with two other manufacturers of self-sealing filter tips. Similar recovery rates may be expected when working with other aqueous solutions having physical properties like water. During pipetting using an air-cushion pipette, there is potential risk of aerosols formation within the pipette system. This presents a concern since it leads to contamination of the pipette and cross-contamination between samples. Filter tips are commonly used as a solution to address this issue. Another source of contamination, unforeseen and often neglected, is the ingress of the sample liquid into the pipette due to improper handling or accidental over-pipetting resulted from incorrect tip size used or wrongly set volume. The occurrence of such risk calls for the need of a filter tip that additionally provides protection against contamination by the sample liquid, apart from guarding against aerosols contamination. This can be realized by having a filter which seals upon contact with liquid, forming a barrier that prevents the liquid from penetrating through the filter and contaminating the pipette (Figure 1). Filter tips behaving in this way are generally known as “self-sealing” filter tips. With regard to the preceding purpose, the filter has to seal effectively against the incoming liquid. The self-sealing filter may then allow release of the sample for recovery. The ability to enable recovery of sample as much as possible presents a tough challenge. Sample loss is especially critical in situations where there is limited availability of sample amount, preparation of sample is difficult and time consuming or when working with expensive reagents. The investigation described herein aims to determine the amount of sample liquid that can be recovered from ep Dualfilter T.I.P.S. SealMax following over-pipetting. In this investigation, distilled water was used as the representative sample liquid. The sample recovery rate is also compared with that of two other manufacturers of self-sealing filter tips. All sizes of ep Dualfilter T.I.P.S. 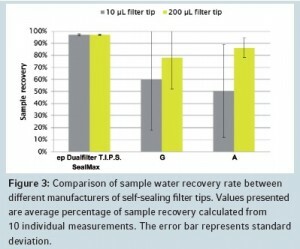 SealMax were tested for sample recovery rate following over-pipetting of water. 10 μL and 200 μL self-sealing filter tips from manufacturer G and A were tested alongside for comparison. 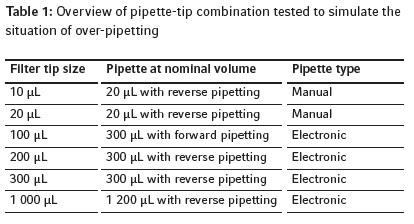 The pipette–tip combination stated in Table 1 was used to simulate the situation of over-pipetting. Electronic pipette(Eppendorf Xplorer®) was used to exclude all manual influences on the pipetting process. Exceptions are for testing 10 μL and 20 μL filter tip size where the electronic pipette with nominal volume 20 μL is not available. 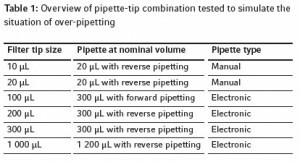 Hence,a manual pipette (Eppendorf Research® plus) was used instead, as indicated in Table 1. Distilled water was used as test liquid. All test conditions were in accordance with Eppendorf SOP  while the test procedure was modified to accommodate the aim of this investigation. For each manufacturer and each test filter tip size, sample recovery rate measurement was repeated ten times using a new tip for each measurement. The average percentage of sample recovery and standard deviation were calculated. The sample recovery rate of all tip sizes of the ep Dualfilter T.I.P.S. SealMax following over-pipetting of water was determined (Figure 2). It is clearly shown that ep Dualfilter T.I.P.S. SealMax enables nearly all of the sample water (> 95%) to be recovered even when the sample liquid comes into contact with the filter, which causes the filter to seal and prevent the liquid from passing through. Maximum sample recovery can be achieved by simply dispensing the sample out of the tip using the pipette. No cumbersome additional work steps, for example cutting the tip, are required. The standard deviation between individual tips of the same size, as represented by the error bar, was also very small. This indicates the high reproducibility of the sample water recovery rate from tip to tip. Both the recovery rate and its reproducibility were consistent across all the different tip sizes of ep Dualfilter T.I.P.S. SealMax. In order to assess the sample recovery rate performance of ep Dualfilter T.I.P.S. SealMax, 10 μL and 200 μL tip sizes were compared with that of two other manufacturers of self-sealing filter tips (Figure 3). 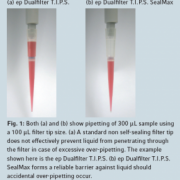 Filter tips from manufacturer G and A demonstrated lower sample recovery rate than ep Dualfilter T.I.P.S. SealMax with regard to water. This was particularly pronounced for the small tip size 10 μL with a difference of 37% lower for manufacturer G and 47% lower for manufacturer A. For 200 μL filter tip, the difference was smaller, which was 19% and 11% lower for manufacturer G and A respectively. Looking at each manufacturer G and A individually, there was considerable difference in the recovery rate between 10 μL and 200 μL filter tips. Such finding suggests dependency of the recovery rate on the filter tip size. However, for ep Dualfilter T.I.P.S. SealMax, the recovery rate remained high and consistent regardless of the filter tip size. Exceptionally large standard deviations were found for both 10 μL and 200 μL filter tips from manufacturer G and 10 μL filter tip from manufacturer A. The sample recovery rate varied substantially from one tip to the other, thus implicating lower reliability of these tips in this aspect. based on the results obtained and observation made during this investigation. (ii) The possibility that the sample properties or behavior is altered after coming into contact with the self-sealing filter cannot be ruled out. This phenomenon was observed for filter tips from one of the two other manufacturers tested. The sample liquid became slightly viscous and had tendency of foam formation. During recovery, some liquid was retained as droplets or bubbles on the internal tip wall (Figure 4). The aforementioned results and discussion refer to the sample liquid of water. Similar recovery rates may be expected when working with other aqueous solutions having physical properties like water. It has to be pointed out that with other liquid types, the sample recovery rate following over-pipetting can be different, depending on the composition of the liquid as well as its concentration. These are not within the scope of the investigation described here. In addition to providing dual protection against aerosols and biomolecules, ep Dualfilter T.I.P.S. SealMax builds a reliable protection against liquid in case of accidental over-pipetting. It also enables recovery of nearly all of the sample liquid, with respect to water, even after coming into contact with the filter. In the context of this investigation, the high reliability of the filter tip in terms of sample recovery rate and its reproducibility when it comes to pipetting water (and other purely aqueous solutions) is shown. The use of ep Dualfilter T.I.P.S. SealMax ensures reliable protection against contamination as well as minimal interruption to workflow despite unpredictable pipetting mistake. Eppendorf SOP – Standard Operating Procedure for Pipettes.